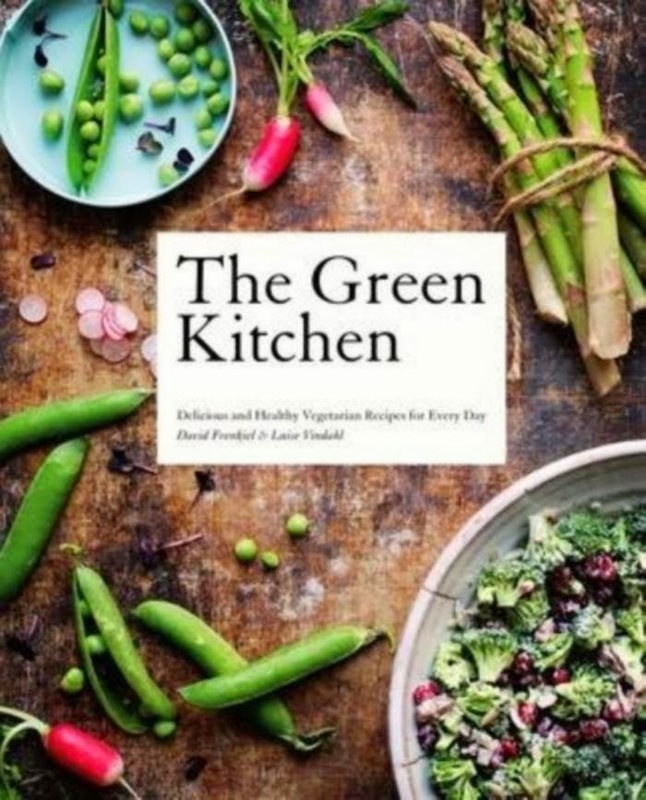 Recently, my mum and I went halves in purchasing The Green Kitchen, a vegetarian recipe book full of beautiful photos and nutritious and easy recipes. It’s written by David Frenkiel and Luise Vindahl, who live in Stokholm and they have an adorable little girl called Elsa. 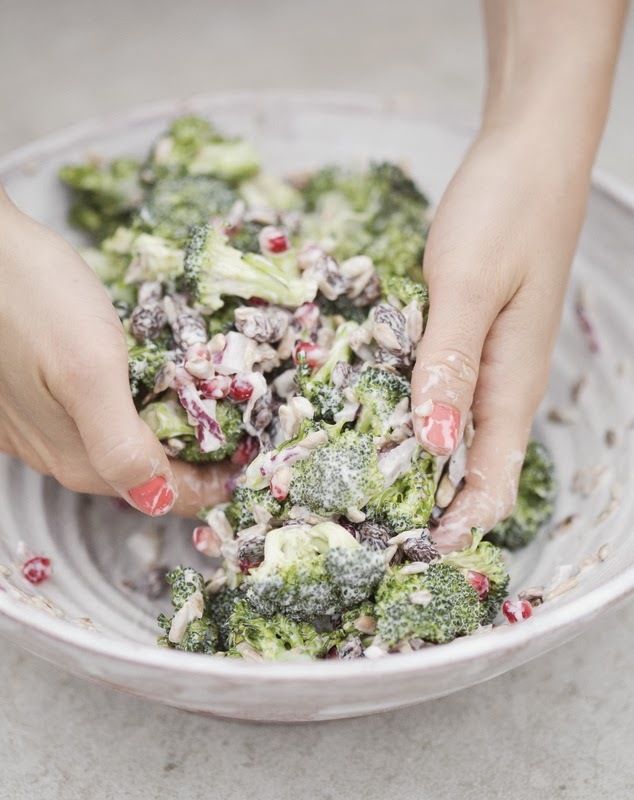 One of the first things I recreated from the book was the Broccoli Salad with Pomegranate and Raisins. I followed it word for word and it’s now one of my favourite salads. I’d never eaten pomegranate before (although I’d had the juice, but always mixed with something else) so wasn’t sure what to expect. Some people struggle with eating broccoli raw but it’s really crunchy and nice! It’s a really refreshing salad, and I can see us making it often, with the warmer summer months ahead. So here I share the recipe with you. I recommend you purchase the book (or even have a squiz in your local library) for more delicious recipes! And check out their blog here. Separate the broccoli florets from the stalk and cut them into smaller bit sized pieces. The book says to slice the remaining stalk and use that as well but the hubby said no way. Place it in a serving bowl with the onion, pomegranate raisins and sunflower seeds. Toss to combine. Add the yoghurt, salt and pepper to taste, and then using your hands, mix the yoghurt through everything, making sure to coat all the broccoli florets. It’s a seriously different but beautiful salad. Give it a go and tell me if you like it! I love it when my husband tells me “This is good, I like this! It’s a keeper.” at dinner time. The first thing I do is print off the recipe and shove it in my folder I keep in the kitchen because it’s good to have that meal where you know you’ll please everyone! It doesn’t happen for every meal I’ve created and placed in front of him but hey, at least he is honest! One of his favourite meals is samosas. They are so easy to do and a good way of getting your vegetables in. O loves them too, which is always a bonus because getting multiple dinners ready is hard when they aren’t all the same! This has been a fortnightly meal in winter because it’s one of those cozy hot foods that are comforting… like soup, you know? And we always get leftovers for lunch the next day. 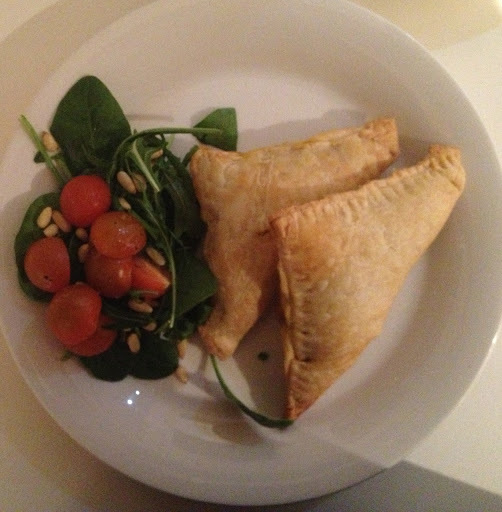 I posted the picture of them on Instagram last night and had lots of positive feedback and recipe requests. Heat a large non-stick frying pan on medium and add the balti paste without oil, and stir for 30 seconds until it becomes fragrant. Add the coconut milk and stir until combined. I have to use the back of my wooden spoon to stop the paste going lumpy in the milk. 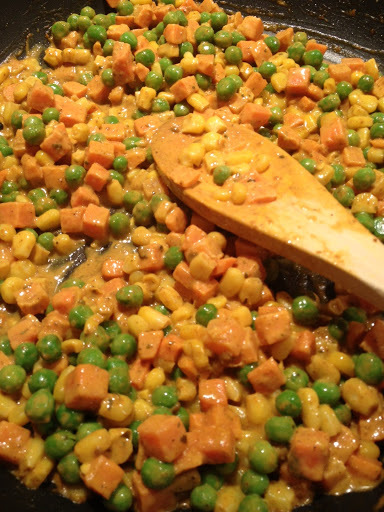 Once it’s thickened a bit, add the diced vegetables. Coat the vegies in the sauce and let it cook for 5-10 minutes, but stir it often. 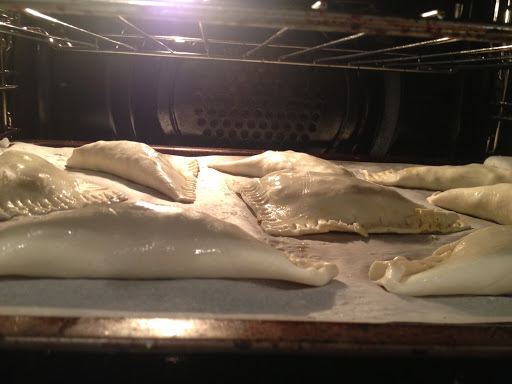 Take it off the heat and thaw your puff pastry sheets. I cut mine into four small squares but it’s up to you! With a pastry brush, brush some water along the edges of the pastry. Spoon some of the mixture into the center of the pastry and fold over. Seal the edges with a fork, or pinch with your fingers. 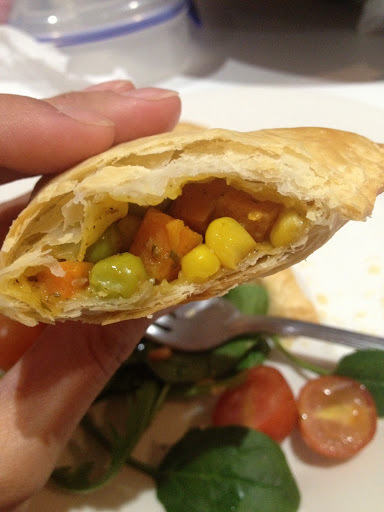 Brush the whole samosa with a bit more water and you can even sprinkle some sesame or poppy seeds on top. 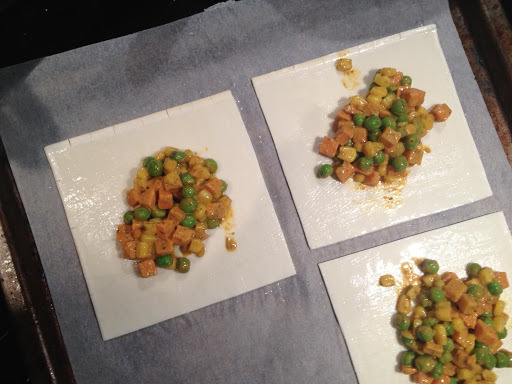 Pop them in the oven for 20-30 minutes. I think any type of paste will work… tandoori, korma etc. I haven’t strayed from balti but might have to now that Coles has stopped stocking it (and 101 other things). Or I could learn to make my own. You could also buy vegan pastry sheets if you wanted to. Do You Know About Yacon Syrup? Style Your Party – A Guide to Kid’s Parties! Top 5: Blogs you must read!